Government has announced plans to build a second entrance to the Diamond Housing Scheme as part of the bigger expansion of the road network links between East Bank and East Coast. Currently, the Diamond and Grove new housing schemes are facing major congestion with only one main access road that is unable to cope with peak hour traffic. Police are being utilized to direct traffic during these peak hours but this does little to quell the daily frustration on what is probably the busiest road in the country. 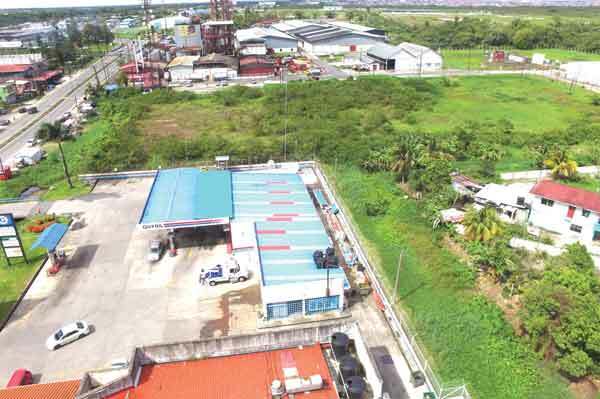 Yesterday, Minister of Public Infrastructure, David Patterson, announced that Government has gotten rum giant, the Demerara Distillers Limited (DDL), to access lands for a car park, market as well as a second entrance to Diamond. The land that is to be used is located between the current Guyana Oil Company service station and DDL’s distillery area. File photo: Minister David Patterson looks at the Diamond Land Use Map, as DDL Chairman Komal Samaroo makes a point. Looking on is DDL’s Finance Comptroller Vasuedo Singh. According to Patterson, in a Facebook post, this situation was because a planned project to build an entrance overpass at the current entrance near the mandir, had been stymied. The land needed to build the overpass is owned by a private business, the M and M Snackette. That transaction had happened under the previous government of the People’s Progressive Party/Civic. The first phase of the project is out for tender for the construction of a taxi stand and market. The closing date for these tenders is March 12. There are plans to include a roundabout. The third phase, likely to be tendered in the third quarter of this year, is the extension of the existing roads to the East Coast – East Bank Bypass. In August last year, the Ministry of Public Infrastructure and DDL had met to discuss the land options. 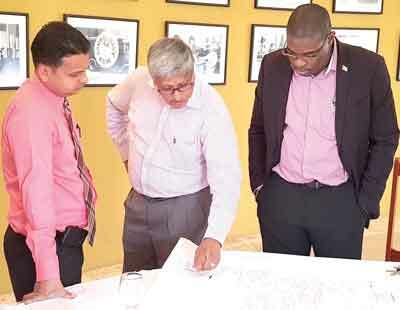 DDL has a sprawling operation that straddles two sides of the public road at Diamond, on a road that connects the hinterlands, Linden and the Timehri airport to the city. Patterson had subsequently reported to Cabinet on the outcome of the meeting. DDL is currently on a major expansion drive, building a warehouse and recently expanding its storage capacity in the rum making process. Among DDL’s expansion plans are the construction of a new packaging facility, a new headquarters building, the establishment of a solar farm for energy generation, and the relocation of the Topco juice plant. The Topco juice plant is located next to where the second entrance to Diamond would be located. With regards to an East Coast link, government is pursuing building a link at the bank of the East Bank villages between Eccles and Diamond that will see a new road leading to Ogle. This is to reduce the congestion on the East Bank public road. There are plans also to build a new crossing for the Demerara River, which will connect to the current East Bank road and the East Coast link at Houston.